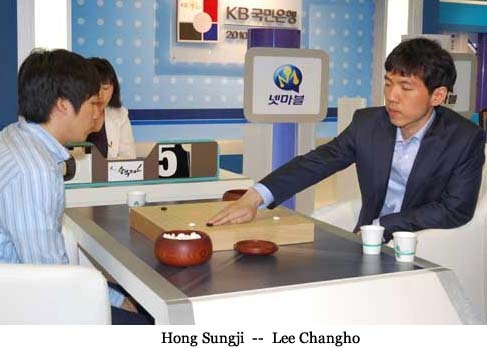 Lee Changho 9P earned a win in the first stage of league play in the 2010 Korean Baduk League Cup when Jong Sungji resigned after 135 moves. Combined with wins from Kim Seongjae 3P and Song Taekon 9P, Changho’s win gave Team Netmarble a 3-2 victory over Team Kixx. 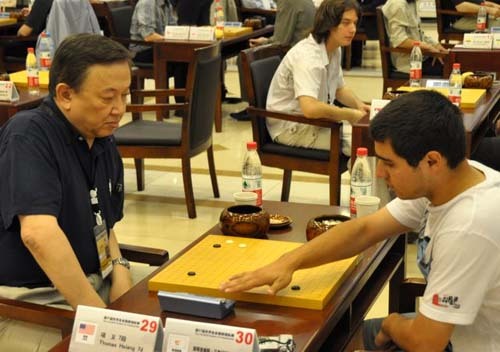 With the 31st annual World Amateur Go Championships now underway and being held this year for only the second time in China, a look at the current status of the longtime rivalry between the three major go powers is instructive. There are nine currently active international tournaments – the Nongshim, Ing, BC Card, Jeongganjang, Asian TV, Fujitsu, LG, Samsung, and Chunlan — that involve China, Japan, and Korea. Half of the latest winners of these are Chinese, and the other half are Korean. 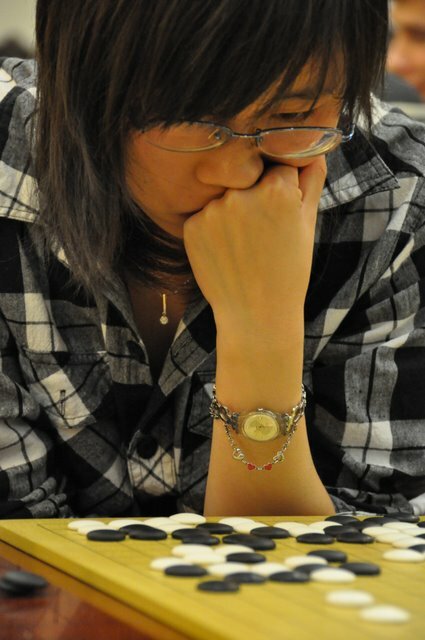 The most recent victory by the Japanese was four years ago, at the 7th Nongshim Cup in 2006 when Yoda Norimoto 9P, in the final game, managed to defeat “iron door” Lee Changho 9P of Korea, who had finished off a win for the Koreans in the first six editions of this win-and-continue team tournament. Several titles have been completely controlled by the Chinese and Koreans. The Ing Cup, which currently has the biggest purse, has been won five times by Koreans and once by Chinese. The Japanese were runners-up twice. 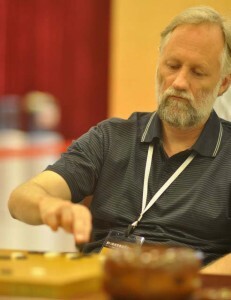 The international BC Card Cup, which includes a Taiwanese representative and has one-hour basic time and 30 seconds byoyomi, has been won once by a Korean representative and once by a Chinese. The Jeongganjang Cup, a team event for women pros, has been split five-three between Korean (five wins) and Chinese teams. Others, mostly longer-running events, have had occasional Japanese winners. 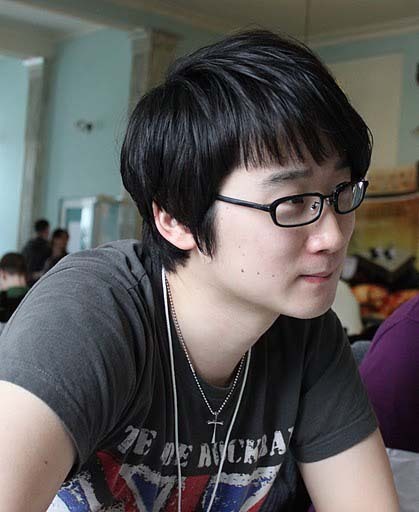 The Asian TV Fast Game Cup (ten minutes and then thirty seconds) has been won nine times by Japanese players, most recently by Cho U 9P in 2005. Otherwise, the Koreans have seven victories versus five for the Chinese. This is the only event in this group won more often by the Japanese than by either of the other two countries. The Fujitsu is the longest-running of these tournaments and the most fully international. 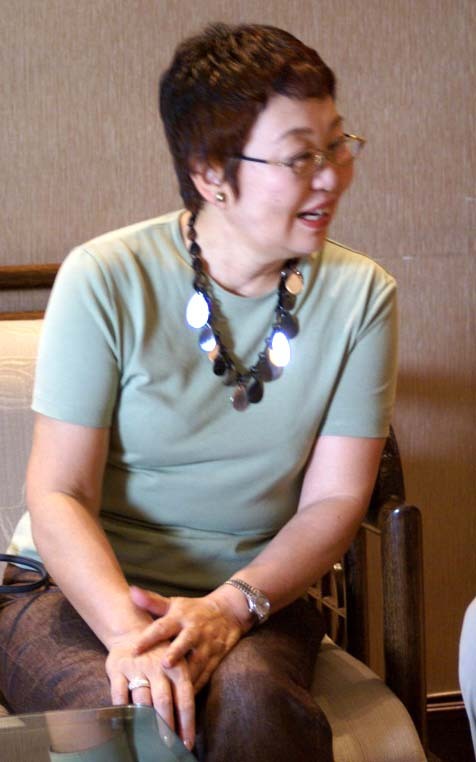 It guarantees a place in the main tournament for representatives from the Americas and Europe as well as Taiwan. On rare occasions one of these representatives has won a game. 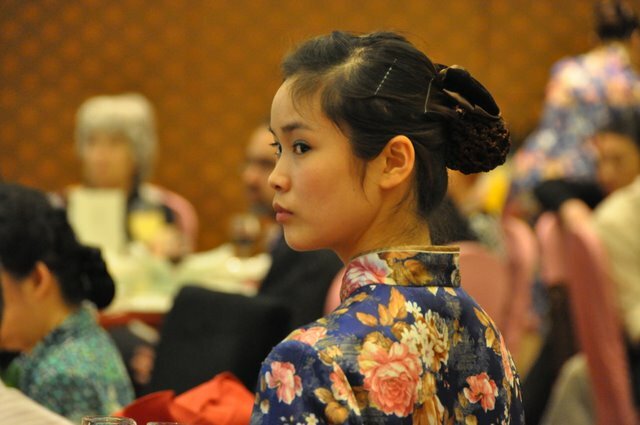 The Koreans have triumphed in it fourteen times, the Japanese six, but the Chinese only twice. The LG Cup saw the only win of one of this group of events by a Taiwanese player, Zhou Junxun 9P in 2007. Otherwise the Koreans have seven wins and the Chinese four, with the Japanese coming out on top twice. The Samsung is open to all pros and some amateurs in the early stages. It has been won twice by the Japanese, three times by the Chinese, and nine times by Koreans. 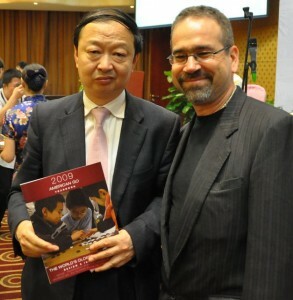 The Chunlan also includes Western and Taiwanese representatives. It has seen four victories by Koreans, two by Chinese, and one by a Japanese representative. If international events that are no longer held were included, the percentage of Japanese victories would be greater since they had better results in earlier days. At present it is clear that the battle for international dominance is between Korea and China. Korea was clearly dominating until very recently, but China is now making a strong challenge for the top spot. 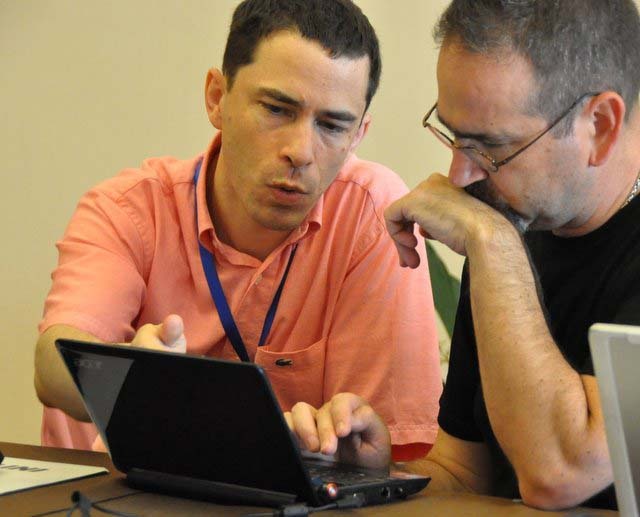 T Mark Hall (left, with correspondent None Redmond), the U.K.’s WAGC rep, lives in London, where he works with John Fairbairn to produce the encyclopedic Games of Go on Disk, better-known as GoGod. 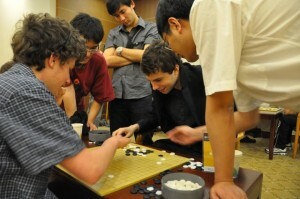 We interviewed Hall right after his second-round loss to Canada’s Yongfei Ge 7d and he was planning to use GoGod – “a large database of professional go games supported by an extensive fund of programs, data and articles to help existing players enjoy and benefit from these games” – to analyze his game. 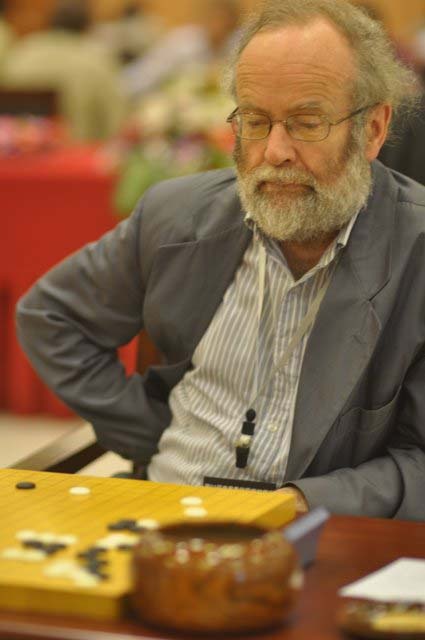 Hall is a retiree from the British Foreign Office; his first assignment was in Tokyo, where he learned go and spent three years playing whenever he could. His travels have taken him to places around the world, including Milan, Nigeria, Greece, Burma and a 1992 stint in Seoul. Hall plans to take advantage of his WAGC trip to China to explore the country through mid-June. 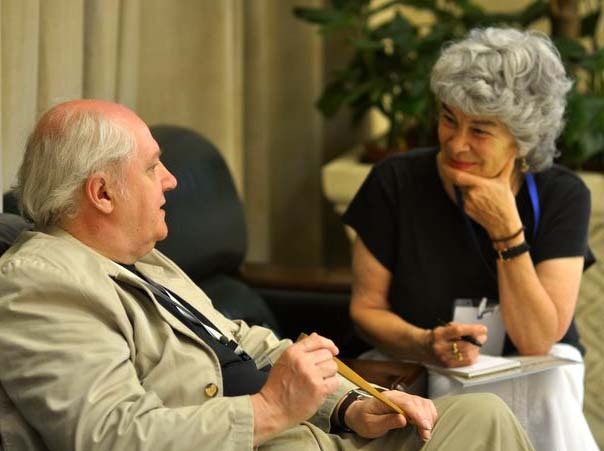 Through the EJ’s extensive network of sources, we have learned that T is Hall’s legal first name, adopted after an employer insisted on using Hall’s first name even though he preferred Mark. 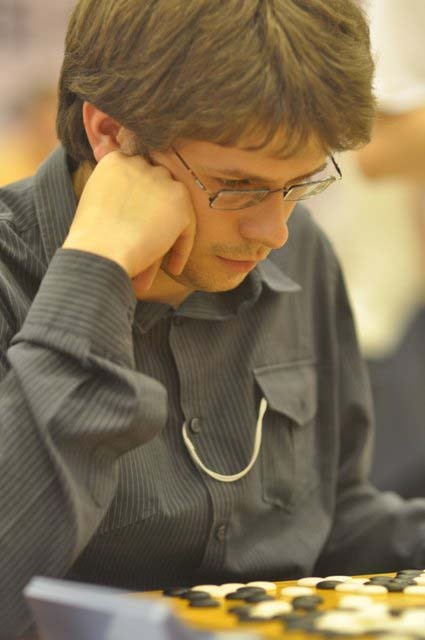 Csaba Mero 6d (r) of Hungary went 7-0 to win the Swiss Championship tournament, which was held in Lausanne May 22-24. Viktor Lin 5d of Austria was second at 6-1, only losing to Mero in round 5. John Walch 3d was third with a 5-2 record, and was the highest placing Swiss making him the 2010 Swiss Champion. Based on his result, Lorenz Trippel 1d will be the Swiss representative to the World Amateur Go Championship 2011. A week after his win in Madrid, Hwang In-Seong 8d (l) went undefeated again to win the Hamburger Affensprung, held in Hamburg, Germany May 22-24. The deciding game was played in round 4 when Hwang defeated long-time rival Cho Seok-Bin 7d who came in second with a 6-1 record. Antti Törmänen 6d of Finland came in third. 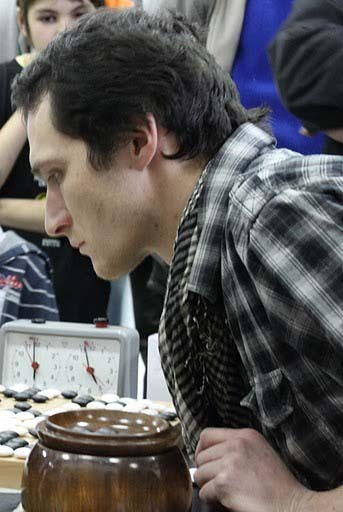 Zeno van Ditzhuijzen, who was recently promoted to 1d, had a good tournament beating three 3d players and two 4d — a year ago he was 13k.